Travelers looking to visit some of South America’s most famous and iconic destinations can reach them more quickly and easily today thanks to LAN Airlines and its affiliates. In 2011, LAN launched nonstop flights to Easter Island, Chile; Iguazu Falls, Brazil; and Lima, Peru. Between Lima and Iguazu Falls, LAN offers four weekly flights on Tuesday, Wednesday, Friday and Sunday. LAN’s Lima-to-Easter Island service returned in February 2012, with two flights per week, on Wednesday and Sunday. LAN has also made getting to the Galapagos Islands a lot easier. In September 2010 LAN Ecuador, an affiliate of LAN Airlines, began daily service between the islands and Quito and Guayaquil, Ecuador. LAN now operates Airbus A320s on these new routes. Last fall, LAN Ecuador also launched a new twice-weekly service to San Cristóbal in the Galápagos. LAN Ecuador currently operates into Baltra, Galápagos, so this new service will enable easier connections to cruise ship itineraries and reduce backtracking for travelers to the islands. Galapagos is a growing LGBT tourism destination regularly visited by LGBT groups. Tour organizations like Olivia and Concierge Travel have offered numerous trips to the islands in recent years. Cusco and nearby Machu Picchu, Peru as well as Punta Arenas, Ushuaia, El Calafate and Bariloche in the Patagonia region of Chile and Argentina are just a few of the other unique tourism destinations to reach from LAN’s hubs in Lima, Santiago and Buenos Aires. LAN also offers flights to dozens of other popular South American destinations with a network of over 90 destinations in the region. Major destinations include Rio de Janeiro and São Paulo, Brazil; Buenos Aires, Argentina; Guayaquil and Quito, Ecuador; and Santiago, Chile. 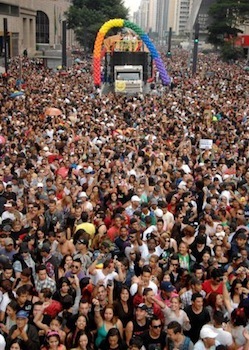 For more information on LGBT travel in South America, visit LAN.com/diversity. South America offers some amazing travel experiences for the LGBT traveler. From Santiago to Buenos Aires, there are plenty of destinations that cater to the LGBT traveler.